Rodeo Moms Club was created to help rodeo moms get up and down the rodeo trail. We hope that it is provindg you tips, training and other information that is useful. We are working on our complete site that should be available in May. The new site will have more resources including videos. Since the club was created to assist rodeo moms, we would like to enlist your help. If you have helpful information, a product recommendation, amazing picture or training tips, please send them to us so we can share them with other rodeo moms. You can email your post to teresa at allhorseutah.com. Also, we know that a lot of rodeo moms have side businesses that you do to support your kids' rodeo. We have a feature called Rodeo Moms in Business. This feature highlights a rodeo mom and their business. We want to help moms promote their business and support their kids. So please submit your business to the email above. We hope to continue to add features, resources and inspiration to our club. Please join us! He is definitely making sure that goat stays tied! In rodeo there are a lot of setbacks. Girls hit their best time in barrels and can't seem to break through. 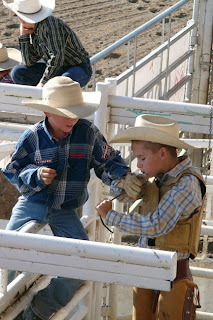 Boys may go 2 or 3 rodeos without catching their calves or getting to the 8 seconds. To get to the next level you have keep going. Getting up or getting back on is the most important part. If you have ever wanted to be a rodeo queen you know that you need colorful wrangler jeans. When we started out I was told to just dye them to match the shirt. Alot easier said than done....but with a little practice you can be GREAT at it. I have found that if you order from Dharma Trading Company http://www.dharmatrading.com/html/eng/3796-AA.shtml?lnav=dyes.html I got better dye matches and they get the order to you quickly. The colors shown on the website are a really close match to what the actual color is. They will send you instructions on how to mix and the legnth of time that the clothes need to stay in the dye vats. I have also learned that you should probably order the extras. The soda ash fixer and the synthrapol detergent. You should also use gloves. (I didn't have any when I dyed the purple pants and my hands were that color for a few days.) Also you need A LOT of white washclothes . I use these to make sure the color is that exact color that you want. It actually is alot of fun and now I LOVE to dye pants to match the shirts. Do you have a child that is interested in getting started in Bull Riding? Riding is an expensive and dangerous event. There is a lot of equipment, stock fees and entry costs. So before you jump in and make a big investment, you should do a few things first. Helmet – Make sure it fits. A loose helmet is not going to help. Vest – This helps if you get stepped on. 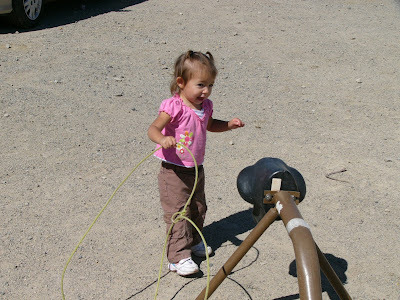 Bull rope – A good rope is stiff where your hand goes. Before you buy, get someone with some experience to help you pick it out. Riding Glove – It is important that you get a riding glove. These are not work gloves. Don’t substitute. Other Equipment – Boots, chaps, spurs, rosin, athletic tape, and strips of leather. 2) Find a local practice arena. There should be a contractor and a bull fighter in the practice pen. The bull fighter is going to help get you out of a bad spot. Be sure to let them know that you are a beginner. Most of the time, they will be helpful. 3) Attend a clinic or school. The best thing you can do for your kids is to have them learn from someone who has done it well. They will learn how to not only ride but how to get off and get out of the arena as safe as possible. Once your child has been on several times and is really ready to make the commitment, start of with the basic equipment above. Check with local kids that ride and see if they have any used equipment. Also look for some small local events to enter and gain some experience. I just have to wonder if he truly landed on his feet and kept going. Always record your practice sessions. (If there isn't someone to record it for you, set up a tripod with the camera on it.) That way you can go back and critique what you have been doing...Good or Bad. You can fix the things that need changing and work on the good things that you are doing. Remember that if you "Practice Perfect" you will preform perfect when the time comes. Bull Riding is an exciting sport. Here are a few things that you need to know about bull riding. 1) The ride time is for 8 seconds. 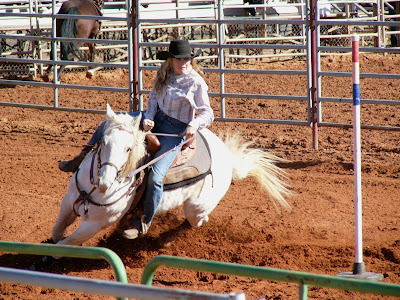 If your child is in junior rodeos, they ride time may be 6 seconds for calf riding or steer riding. Check with your local association. 2) Bull riders ride with 1 hand and can not touch the bull or themselves with their free hand. 3) Riders are secured by a bull rope. The rope wraps around the bull and then the rider is wraps the remainder of the rope around their hand to secure themselves to the bull. 4) There is no mark out in bull riding. Staying on the 8 seconds is the main priority. 5) The score is calculated by 2 judges. Each judge gives 25 points to the rider and 25 points to the bull. The total maximum score is 100 points. 6) The bull score is based on the speed, power, drop in the front end and kick of the bull. 7) The rider score is based on the ability to match the bull. They look for control and body position. In the next post, look for basic equipment requirements and getting started. You never know when someone might catch a dream from you, you never know when a little word or something you may do, may open up the window of a mind that seeks the light. The way you live may not matter, But then again it might. And just in case it could be that another’s life through you might possibly change for the better, with a broader and brighter view. It seems it might be worth a try at pointing the way to the right. Of course it may not matter at all, but then again ….. it might. When you look at a picture with those horses leaning so far in, I wonder why we let our children do this? It looks like the horse could never recover from this position and this happen 3 times in a pole pattern. Spring is here which for many of us means spring cleaning. So the walls are scrubbed, the windows, washed, closets cleaned and winter clothes are washed and stored for another season. So what about your horses and cattle? Do we take the time clean out their stalls, wash out their buckets, and feeders? You can use baking soda, small amounts of dish soap, or mouth wash to clean out their water troughs. Make sure you rinse them thoroughly. Then, keep their feeders separated from their water trough to try and eliminate hay and manure from getting in their troughs. Just as it is important for us to have clean organized houses it is equally important to clean and organized your animals home. They will feel better and act better. She thinks she is a roper! Look mom at what I can do. I have decided there is no better support group than rodeo families. 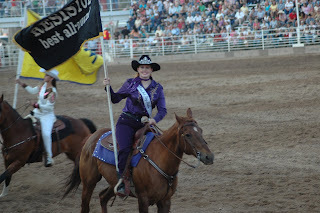 We went to our latest Central Utah Little Britches Rodeo and as I think back, I am so grateful for the friendships that I have made as a result of my kids being involved in the sport of rodeo. Troy stayed in his trailer at the arena while the rest of us went and stayed in a motel. Troy was so good to feed and water the horses for us before we got to the arena. Thanks a ton! It was nice to have one less thing to worry about. Now before everyone goes feeling too bad for Troy…he does have a living quarters trailer. But seriously, by the time we got there, the chores were done. Terrie and I decided we would save ourselves some money, so she drove and hauled the horses and I picked up the motel room. I thought it was a really good idea, until Kyla was sick all night Saturday night. Sorry Terrie! 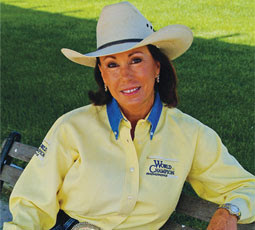 Terrie was also so very good to help my kids get old Molly Moo Cow saddled, unsaddled and put away. My husband wasn’t able to go, so I am so grateful to Terrie. Thanks again. Racheal and Ashley were so good to Kyla. By way of explanation, Kyla is five. She wants to be a big girl so badly. I looked out when the kids were all warming up their horses, and there was Kyla riding with Racheal and Ashley. You girls really made her day! And thanks again Racheal for being willing to help make sure that she was ready! To Coy…aka the surrogate father…thanks for all the time you have put in with my kids! Kyla hadn’t done goats before when she had to jump off the horse. Coy got her to watch so that she knew what she was doing. We are grateful for ALL that you have done for us. Also thanks so much for hauling the animals. We wouldn’t be able to have the rodeo without the stock and we appreciate your willingness to help! Thanks to Teresa for just putting up with me! She gets to sit at the table with me ALL DAY! (I am not sure if “gets” or “has to” is the right word) I did bring some treats to make it a little more bearable. Just kidding Teresa, but I really am grateful for your friendship. Thank you for all the time that you put in for our kids. You make sure that everything is done on time and that the rodeo runs fairly smooth. Thanks! I would like to thank Dallin, Troy, and Dan (and families) for the time they put in for our kids. Judging a rodeo CANNOT be that much fun, but I want you to know that we appreciate it! Also Troy, thanks for all you did to set up the roping on Saturday. It ended up being a great thing! Edna, Lisa, Kendra, and Taunya—thanks for all of your help timing. More importantly, thanks for helping to keep me straight. You guys are the greatest! Last but certainly not least, thanks to my husband. He puts up with a lot of crap and I am so grateful for him. He lets me follow the kids to the rodeos. He is usually there to be the stall boy even if it’s not his favorite thing. Thanks to Karlin for understanding so that Steve and I could split and go different directions with different kids. Thanks to Kass for all your help posting the results! And thanks to Kyla for making life fun. I love you all and don’t know what I would do without you! This is true no matter what rodeo we are headed to. The support system in place is amazing! I just wanted to say thanks to everyone! One of the first things I like to get ready is the trailer. This is just one of the necessary things we have to do before hitting the road. A lot of women are doing this by themselves and the best advice is to be prepared. .As such there are several steps to getting your trailer prepared for the season. 1. Check tires for wear and replace if the tread is getting thin. Make sure to check the spare also and make sure that it can be removed from its mounting. Over time the mounting may rust and having a rusted on spare is not too much fun if you’re stranded on the road. Also check the lug nuts on all tires to make sure they are tightened. 2. Have a tire gage and use it often. The proper tire inflation can usually be found on the outside of the tire, if not find out the proper pressure from your local tire dealer. 3. Have a jack and know how to use it. Even better is to have a trailer ramp, I think the trailer ramp it is lot easier and safer to use. Also make sure you have a lug wrench and make sure you loosen the lug nuts before jacking or using the trailer ramp! 4. Check your electrical connection to the truck and make sure there are not exposed wires or loose connections. 5. Check the trailer lights to make sure they are all working properly. Replace any broken or burned out bulbs. Get someone to help you to make sure that the turn signals and brake lights are working properly. 6. When is the last time you had the bearings greased? If you can’t remember, its time. Depending on your trailer use, they should probably be greased every other year. Have your trailer brakes checked when you have this done. 7. You might want to pack safety flares or reflectors to warn other motorists. 8. Finally, if you don’t know how to change a tire on your truck or trailer learn!